Philippines is rich in natural resources. Many are still untapped. But with the dramatic turning point of industrialization in the countryside, some of the farms and virgin forest have now been converted to either real estate development or manufacturing sites. One of the endangered species is the Philippine Eagle. Im posting here the story when I researched from the website of National Geographic. If the irrevocable transition of one species from rarity to extinction causes a rent in the fabric of our planet, exactly how big a hole would be left by the loss of the Philippine eagle? No disrespect is meant to the basking malachite damselfly or the fine-lined pocketbook mussel, because all creatures—and plants too—help turn the infinitely complex cogs of the biosphere. But the loss of this glorious bird would steal some of the world's wonder. It glides through its sole habitat, the rain forests of the Philippines, powerful wings spread to seven feet, navigating the tangled canopy with unexpected precision. It is possible that no one has ever described this rare raptor, one of the world's largest, without using the word "magnificent." If there are those who did, then heaven heal their souls. In the kind of irony all too familiar to conservationists, however, the very evolutionary adaptations that made it magnificent have also made it one of the planet's most endangered birds of prey. There is no competition for prey from tigers, leopards, bears, or wolves in the Philippine archipelago, the eagle's only home, so it became, by default, the king of the rain forest. Expanding into an empty ecological niche, it grew to a length of three feet and a weight of up to 14 pounds. A nesting pair requires 25 to 50 square miles of forest to find enough prey—mammals such as flying lemurs and monkeys; snakes; and other birds—to feed themselves and the single young they produce every other year. "The birds had the islands all to themselves, and they grew big," says Filipino biologist Hector Miranda, who has studied the eagles extensively. "But it was a trade-off, because the forest that created them is almost gone. And when the forest disappears—well, they're at an evolutionary dead end." Indeed, with deforestation rates in the Philippines among the highest in the world (more than 90 percent of primary forest may have been lost to logging and development), the eagle has been reduced to a population estimated at several hundred breeding pairs. Awareness about conservation issues, however, is rising in the Philippines. A series of devastating floods and mud slides in the past decade has convinced Filipinos that the loss of forest affects not just wildlife but people too. In recent years new protected land areas have been established in the Philippines; one, the 17,300-acre Cabuaya Forest, specifically protects the eagle. 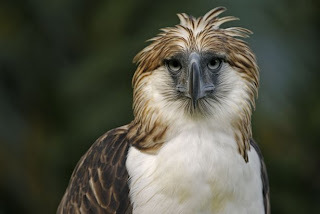 And in an effort to prevent the eagle population from dwindling further, the Philippine Eagle Foundation on Mindanao island is working to educate Filipinos about the bird, which was declared a national emblem in 1995. At least some of those who once would have shot an eagle for food or sport now let it soar unmolested.